Composer, born in Savoy. As a boy he studied in Paris with Lully and others in 1663-69; he was appointed organist at Molsheim Cathedral in 1671, then went to Ingolstadt to study law. He later traveled to Vienna but could not obtain an official appointment and subsequently appeared in Prague (1677), ultimately finding a position in Salzburg in the service of Archbishop Max Gandolf, a post he held for over ten years. He was given leave to travel in the 1680s and studied in Rome with Pasquini ; some of his compositions were performed in Corelli 's house. From 1690 until his death he was Kapellmeister to Johann Philipp von Lamberg, Bishop of Passau. 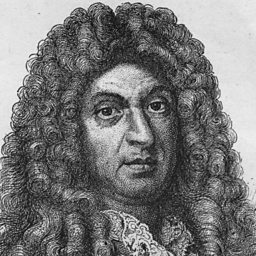 Muffat was instrumental in bringing the French and Italian styles into German- speaking countries, prefaces to his published works provide details about Lully 's and Corelli 's practice for his German audience. His Armonico tributo (Salzburg, 1682), with its careful use of the letters T and S to indicate tutti and solo passages, belongs to the early history of the concerto grosso, these compositions later appeared in modified form in Ausserlesene Instrumental-Music (Passau, 1701). The two volumes of orchestral suites ( Suavioris harmoniae instrumentalis hyporchematicae florilegium primum, Augsburg, 1695; Florilegium secundum, Passau, 1698) are particularly fine examples of French influence on a German composer -- Muffat (along with Kusser) was one of the first to incorporate the French overture into the German suite.